Offering every musical necessity available, Jimmy’s Music & Supply provides quality gear and ways to get involved with Durango’s music industry. Owner Jim Gillaspy of Jimmy's Music & Supply brings 28 years of experience learning what musicians in the Durango area need and are looking for, resulting in the perfect local music store. 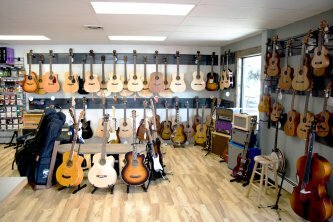 From guitars to violins and percussion to orchestra, Jimmy’s Music & Supply makes sure to keep all instruments and their accompanying necessities and accessories readily available. Picks, reeds, sticks, instructional music, strings for any and all instruments (guitar, bass, violin, mandolin, viola, cello, banjo, ukulele, and many more) and even the ideal equipment setup to help you record in your home studio. If you’re looking for advice and feeling eager to get connected to musicians, desperately need a new instrument, or even just a new pack of guitar strings, Jimmy’s Music & Supply has you covered. Jimmy’s Music & Supply is home a to an ever-evolving repertoire of unique gear. From a 1947 Gretsch Synchromatic to a 1967 Gibson SG, you’ll always be surprised. Stringed instruments like mandolins, fiddles, guitars, as well as a range of amplifiers constantly come in. Jimmy’s Music & Supply has one of the lowest consignment fees in the industry on these instruments, putting more money in your pocket for the next gear acquisition. Make sure to come on by whether you’re looking to pick up a distinct music-maker, or you’ve got one ready to be traded; there’s always something new to ogle and ready to be played. Growing up in the local music industry, Jim grew up working with his family at a music store. When it shut down, he decided he couldn’t leave Durango’s music scene without a quality store to return to time and time again; so Jimmy’s Music & Supply was born. For any musicians looking for more gear to expand their collection, or beginners looking for how to get plugged in, Jimmy’s Music & Supply has every capability to help any musician’s needs. 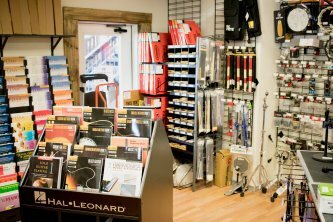 By providing affordable quality gear, advice, repair services, and decades of knowledge, Jimmy’s Music & Supply is your one-stop-shop for all things music. 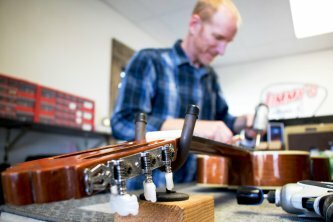 On top of their endless stock of unique gear, Jimmy’s Music & Supply offers the complete package for musician needs by offering restrings and repairs to your instruments, making sure that you never have to live a day without being able to play your instrument. Bring in your beloved string instruments for Jimmy's one-of-a-kind Signature Spa Day whenever you’re ready to give it some unparalleled love.